Sometimes, my friends, the stars align, and something amazing happens. I spent most of yesterday coughing, sneezing and generally just feeling yucky, so when I woke up this morning not feeling much better, I called in sick to work. I kind of freaked out and purchased a ticket to his Denver show, since LD lives there, before realizing he’s also going to Spokompton, which is much closer and would be much less expensive to get to, but oh well! 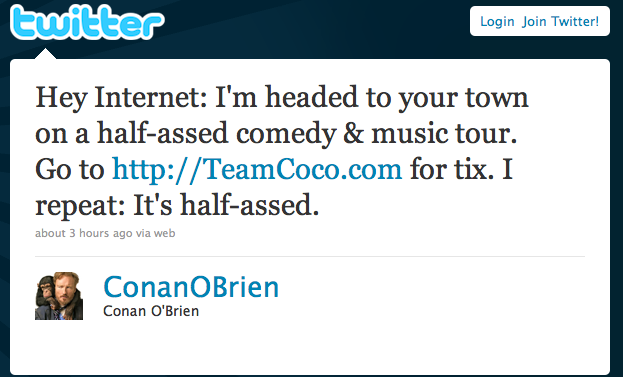 I’M GOING TO SEE CONAN!! LIVE!! IN PERSON!! ON MAY 10!!!! OMG! OMG! OMG! OMG!!! OMG!!! OMG!!!!!!!!!!!! Because of this, what started out as a less-than-stellar day has turned into a pretty good one. Does that mean I have to go into work now? Oh Nice!!!!!! I have to say I am very very very jealous…. :o) That’s going to be awesome!